AKG, the Austrian company that was conceptualised in Vienna, now has a fan following across the world. Originally a production unit of technical equipment, AKG soon expanded and adapted to a growing world of sound and music, beginning to cater to a wider market: loudspeakers and car horns to headsets and microphones. Today, AKG is the proud recipient of the prestigious Technical Grammy Award (2010) that stands testament to the excellence of their myriad sonic equipment that serve a global market of professionals as well as audiophiles. The AKG K391NC is another feather to the cap. With high performance, digital active noise cancellation, the K391NC is one of the best in-ear headphones on sale. It is incredibly light and cleverly crafted to fit into the small carrying pouch provided. Don’t like the music they are playing? Not to worry! These nifty headphones fit right into your iPhone and/or smartphone to give you your little corner right in the middle of a crowded transport. Whether a frequent flier or a regular in the metro, AKG K391NCearphones ensure a quiet, peaceful and light journey! Active noise-cancellation is still rare in earphones (mainly headphones have had that privilege so far), but that is precisely what makes the AKG K391NC earphones one of the best high end, noise cancelling headphones in the business. Audio output available when functioning in passive. Inline compartment houses the noise cancellation circuitry. High quality universal remote/microphone for taking calls/video chats. Very compact and superlight design. 35 hours of battery life that can be recharged using the mini USB cable provided. 1 Pair of AKG K391NC in-ear noise cancelling headphones. 2 different detachable audio cables for different smartphones and/or iPhones. The AKG 391NC active noise cancelling headphones have a no-fuss, no-nonsense, functional design. It completely shirks flamboyance to go for a rather smart, sophisticated and chic look. The body comes in a steel/aluminum finish, with black highlights accentuating the curves. The ear buds are made of pliable silicon that molds to the shape of the ear canal. The noise-cancelling circuitry is housed in a small rectangular body with the battery inside it, attached to the main chord running down from the left ear. It comes in the same shades as the rest of the device and has a mini USB port at the bottom to support recharging with the USB provided in the box. 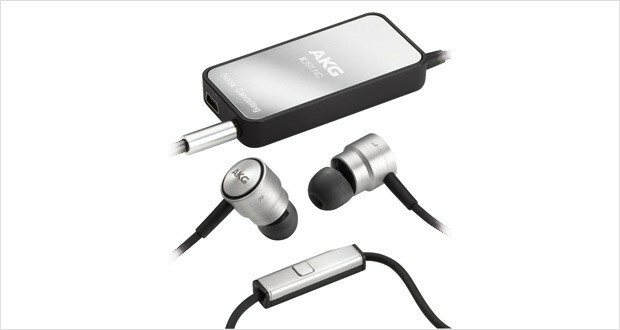 An on/off toggle switches the active noise cancellation on and off and an indicator light shows the status.The fact that the noise cancelling unit is at the end of the first piece of cable also means that the AKG K391 NCs can be used to ONLY block out sound. There are two detachable audio cables provided, one in black and one in silver coats, which can be attached to the end of the battery compartment for a music experience. There is however, no scope of volume adjustment. Dimensions1.6 x 5.8 x 7.8 inches"
The material is a clever combination of metal and plastic. The box contributes most to the minimal weight of the AKG391NC. Each component is well made and durable. The headphones are extremely light in weight. However, the dangling noise-cancellation circuit is annoying while walking/running. The earbuds are slightly stiff and cause ear fatigue if not the exact fit. The highs are clear and well defined with the noise cancellation turned on. 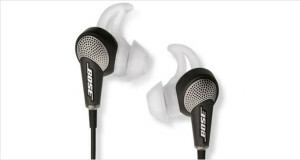 Bass is full and rich with active noise cancellation. However, turning the noise cancellation off, immediately does away with the fullness. AKG has done a marvellous job of engineering the K391NC in-ear headphones that compete with the bigger fish in the noise-cancellation market. There close fitting earplugs offer a decent degree of passive noise cancellation. The active noise-cancellation doesn’t come with a promise(not even an approximate one) of how far the sound will be reduced. It works quite well with the high range (hisses) but works better for the low range (drones). The sound signature is decent with the noise cancellation turned on. However, sound dulls out significantly with the passive mode turned on, giving the impression that the device was built more for keeping noise out than keeping sound in. The active noise-cancellation cuts down sound with a wide range of frequencies. Works in passive mode via the audio bypass cable. Small, hassle free battery box. Battery is rechargeable with the USB provided. Flight adapter allows in-flight charging for those extra-long journeys. Three different earbuds provided to allow for a maximum fit. The silicon ensures a snug sitting. Two detachable audio cables allow use with a variety of different smartphones/iPhones. Also allows easy replacement in case of damage and storage. The in-line one button universal remote control and microphone is an easy way to take calls. Quality of calls and video chats via the mic is excellent. The case provided can house your smartphone, and is hard enough to protect it from inadvertent bumps and bruises. Compact design that is travel friendly. Slightly stiff ear buds that cause ear fatigue after a while. Seal is not too tight. Sonic experience is less dynamic in passive mode. The wire is not long enough to carry the audio device connected to the earphones in your pant pockets. If mobile, the battery compartment jiggles along, causing disturbance. Wear and tear on the headphones connection to the noise canceling unit is a concern as it does not have additional support while being responsible for carrying the noise canceling unit’s weight. The overall deliverance of the AKG 391NC active noise cancelling headphones is satisfactory for the most part. The sound stage is decent with the active noise cancellation. Even though passive mode delivers substantial muddiness, the rechargeable battery is a nifty feature that allows a hassle-free revival. Though the MRP is high, the headphones are widely available at a far discounted price that does reasonably well for the performance it gives.